The most important thing that OSP builds is not schools or water collection systems. The most important thing that we give is not water tanks or scholarships. The most important thing that we build is relationships, and the most important thing that we give is ourselves. The OSP mission is not one of charity—simply giving away money or resources to people who do not have them—but rather of solidarity. Our goal is to help impoverished, oppressed, and forgotten people build power in their own communities and out of this new, democratic, grassroots base of power, connect them to people and organizations who not only want to help them build themselves out of poverty, but to know them, love them, and accompany them as people. We believe that out of these relationships, we will not only change the material lives of the Salvadoran poor, but also the spiritual lives of the Americans who have chosen to accompany them. In building real relationships with one another through and in Christ, we not only liberate the poor from their oppression and poverty, we liberate the wealthier and more privileged by awakening them to the knowledge that God has most clearly revealed Godself to and through the poor, the suffering, and the oppressed of history. We hope that this newfound knowledge and real love for the people of Berlín will inspire our American brothers and sisters to act, pray, and live differently. By opening our eyes and our hearts to one another, by encountering God in the Other, we can participate more deeply in the building of God’s present and yet-still-immanent Kingdom: a kingdom of peace, justice, solidarity, and love. Approximately 40% of the population of El Salvador lives in rural areas, and 80% of these rural dwellers are subsistence farmers. Berlín, El Salvador is one such rural area with many impoverished farmers, and we strive to accompany them in both their material and relational needs. Because the soil of El Salvador has been abused and overworked for centuries, it will not yield a good crop without the help of chemical fertilizer. Without it, families face poor nutrition or even starvation. Fertilizer, at its cheapest, costs somewhere between $50-$60 a bag, making these essential fertilizers impossible for many families to afford. When OSP partner churches help families purchase a bag of fertilizer, it increases their harvest yield dramatically. This is particularly important in years when the corn harvest is poor and fertilizer can mean the difference between harvesting little to nothing and having just enough to eat. Even in good harvest years, their generosity might mean the difference between having little to eat and having a little extra corn to sell, making it possible for farmers to buy other things their families need and to provide their children with an education. Our Sister Parish also strives to provide Berlin-area farmers with trainings and connections with other farmers across the country. We have worked with our partners to provide trainings in organic agriculture. We have also hosted a seed exchange to help Berlín-area farmers build relationships with other Salvadoran farmers, protect their native seeds and agricultural traditions, and increase crop diversity. At Our Sister Parish, we are proud to be supporting over 120 scholarship students who are trying to finish their middle school or high school education. Some receive these scholarships through their partner churches. Other scholarships come from the general education funds we have here at the Pastoral House. That fund is supported by donations from a variety of people. Without some kind of accompaniment and financial assistance, many Berlín-area students would not be able to afford the pens, paper, markers, uniforms, and other materials that they need to continue their education. For many children, the greatest obstacle is simply reaching the nearest middle school or high school: some of them live a several hours’ walk away from the closest educational institution. These scholarships help to provide many students with the opportunity to travel to school by car or to rent a room in downtown Berlín during the school week so that they can continue going to school. Our Sister Parish also works to support education in Berlín in other ways. Working with partner churches and organizations, we have built schools in the communities of Tablón Cerna, Corozal, and (most recently), Mediagua so that students can begin, or continue, their education closer to their homes. Our Sister Parish also works with partner churches and communities to provide basic medicines and medical treatment to the people in Berlín. Many families here barely have enough to eat, so when someone becomes sick with parasites, infections, pneumonia, or even just a headache, they often do not have money for the medicines that they need. Even basic medications such as acetaminophen for pain or tetracycline for infections are beyond what many families can afford. Much of this medicine and support for medical appointments comes from proceeds from the Don Justo Coffee project. The Pastoral Team works to provide funds for medicine, medical tests, and transportation to medical appointments for people living in both partnerned and un-partnered communities. We have also worked with churches and other organizations to provide basic medical equipment such as nebulizers or diabetic testing supplies to rural clinics in Berlín. We help to supply rural communities who do not have a clinic with a basic medicine cabinet so that they can treat minor medical issues such as cuts, headaches, or stomach flu in their own communities. 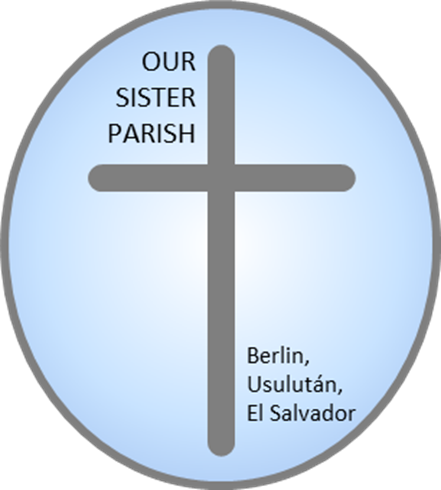 Beginning in 2015, Our Sister Parish will be sending an annual a medical delegation to Berlín, El Salvador. Please contact us for more information. As is true for many in the developing world, the rural families of Berlín often do not have enough water to drink, cook, clean, or bathe, and the water that they do have access to us often unsafe, causing them to suffer from parasites, other stomach and intestinal maladies, and other more serious conditions. From November to May, there is little to no rain in Berlín. During this dry period, many of the people in Berlín rely on a rural water project for all of their water needs. Unfortunately, the water only runs for an hour or two every 8 to 15 days—when the system is working. When the system requires repairs, it can take up to three weeks for the water to run again. Without a clean, safe place to store water to use for cooking, cleaning, washing clothes, or drinking when it does run, families have no choice but to obtain highly contaminated water by walking for miles to a far-away river or to purchase this vital resource at an extremely high price. Our Sister Parish works with partner churches in Iowa and other organizations to provide water tanks to families in Berlín, who use them to collect and save water from the rural water project, or to collect and save rainwater if they are not connected to that project. We have also helped to build, maintain, and repair water systems throughout the communities of Berlín. We have also worked with partner organizations, such as the Rotary Club International, to provide slow-sand filters to hundreds of families in Berlín and nearby areas. These filters, when well maintained, provide families with safe, clean drinking water for many years. Construction of clean, safe latrines for rural families. Gift baskets for the elderly during the holiday season. Sponsorship of community events and celebrations. Chairs for communities and families. Repairs to soccer fields and other assistance for community soccer teams. Pastoral care and spiritual accompaniment.